I am so ashamed to admit that Dexter has never been baptized. This isn't because I am too lazy or not Christian enough. It simply has to do with the fact that we had a hard time getting Dexter's god parents together. One lived in Portland and the other in Kansas City. That coupled with the fact that I am Protestant and my husband is Catholic.......well, you get the idea! I also never got my christening gown from my mother so Dexter had nothing to wear. Well, the time has come ladies and gentlemen, Dexter will be baptized in July. I didn't want to wait until the baby was here because I want them both to have their own special day! Dexter will wear a cute white Ralph Lauren polo shirt and khaki pants. It will be perfect. Although, in my opinion, perfect would have been him wearing a priceless Christening gown at 6 months of age but 2 will have to do! What about baby number two you ask? Well, I have that covered! I recently came across Precious and Few and I was blown away by their gorgeous, handmade christening gowns. They were so generous to send one for the new baby's special day. 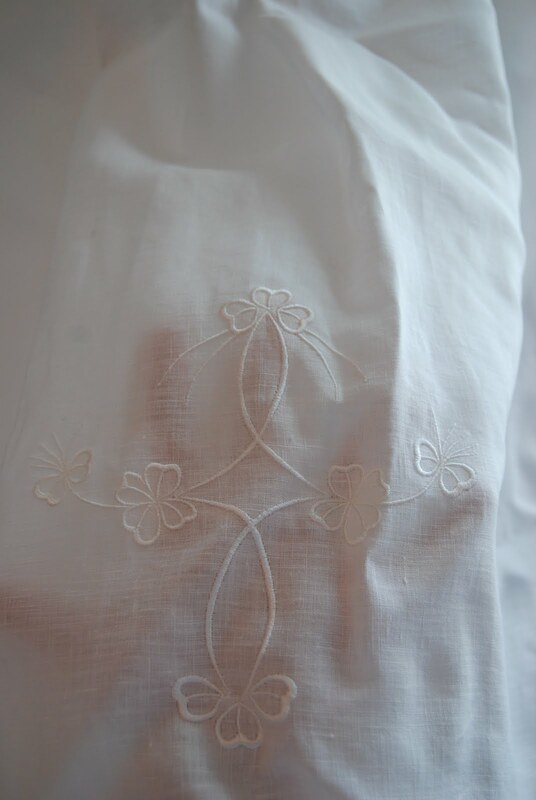 It is made of linen and has the most intricate detailing. The whole gown in trimmed in lace and their is, what I think resembles an Irish cross, on the front of the gown. Here are a few pictures that I took. My camera may be nice but my photography skills do not do this gown any justice! The gown came wrapped in tissue paper and it was packaged with care. Included with the gown, other than lots of love was a sweet little bonnet trimmed in lace as well. I couldn't take a decent picture of it but I know you get the idea. These gowns were made with love and meant to last. This is a piece that you will cherish for generations to come! After baby makes his debut into this world expect another Precious and Few post showing him off in his Embroidered Christening Gown! Gorgeous gown! My MIL purchased an heirloom quality gown (similar in style to this one here) before our oldest was born and each of my children has worn it. We also embroidered each of their names and Christening dates. 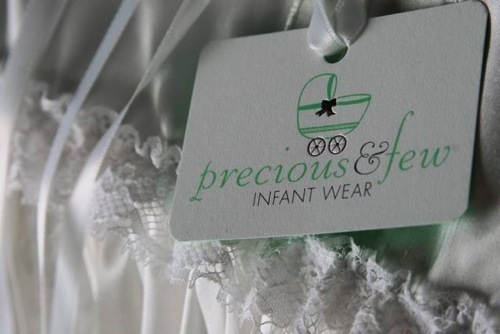 Your new baby will look so sweet wearing this! This could be passed on through generations. Stunning! Beautiful!! I'm going to look at the website and see if they have special occasion wear for boys too.